Colonel Sanders - Kentucky Fried Chicken StoryAfter many years of serving his secret fried chicken recipe in his local restaurant, Colonel Harland Sanders found himself in need of a new career. At the age of 65, he began to collect his social security check of about $100 as he wondered how he was going to survive financially. Colonel Sanders BackgroundGrowing up in Indiana, household responsibilities were often left to him while his mother worked to support the family after his father's early death. This is how he developed his keen cooking skills as he helped his mother take care of the other children in his family.Several different jobs later, Sanders began his entrepreneurial career running a service station in Kentucky while serving his special chicken in a dining area within. As business grew, he relocated to a restaurant close by in order to make his original recipe with its blend of eleven herbs and spices accessible to even more customers. He also added a motel to the business. In 1935, at forty-five years old, Sanders was dubbed a Kentucky Colonel by the Governor, in recognition of his fabulous cooking skills. 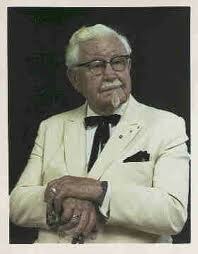 Subsequently, in 1940 Sanders created his well-known "Original Recipe." Colonel Sanders’ New Cooking TechniqueSanders originally prepared his chicken in an iron skillet but soon realized that was not efficient in a restaurant setting. In order to decrease the wait time for his customers, Sanders modified his cooking procedure by making use of a pressure fryer.Colonel Sanders’ Entrepreneurial DriveThe Sanders Court & Café catered mainly to travelers on their way to Florida through the town of Corbin, Kentucky. However, in the early 1950's, a new interstate was in the works that would cause a great loss in business, forcing Sanders to retire and sell his restaurant.However, the government check was small and Sanders wasn't willing to just sit still and try to make due. He believed there was an opportunity to market his chicken to restaurant owners across the U.S. In his travels, he was rejected on many occasions, laughed at about his attire of his starched white shirt and white pants. However, Sanders persevered, and after a little over 1,000 visits, he finally persuaded Pete Harman in South Salt Lake, Utah to partner with him. They launched the first "Kentucky Fried Chicken" site in 1952. In the early 1960's there were over 600 franchised locations in the U.S. and Canada selling the delectable chicken. Subsequently, in 1964 Sanders sold the franchising operation for $2 million. The franchise has been sold three other times since then and continues to be a well-known successful business.